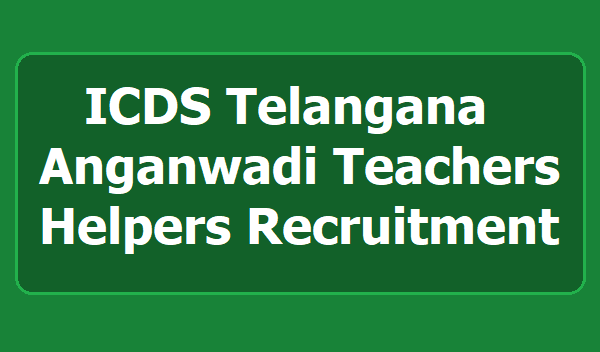 Anganwadi Teachers, Anganwadi Helpers Recruitment 2019 by ICDS Telangana: District Women, Children Welfare Department, Hyderabad District, Telangana has issued Anganwadi Posts recruitment 2019 notification on February 21, 2019 for filling up the posts of Angawadi Workers (Anganwadi Teachers), Anganwadi Helpers (Aayas), Mini Anganwadi Workers (Mini Anganwadi Teachers)in the Hyderabad District. Eligibility Criteria for Anganwadi Teachers, Anganwadi Helpers Recruitment 2019, Selection Procedure for Anganwadi Workers, Anganwadi Helpers Recruitment 2019, How to apply for Anganwadi Posts Recruitment 2019, Online application Form link of Anganwadi Workers, Mini Anganwadi Workers, Anganwadi Helpers Recruitment 2019, Last date to apply for Anganwadi Teachers, Aayas Recruitment 2019 and more details would be available on ICDS Telangana Website. Selection procedure: Selection procedure through Online Anganwadi Recruitment Software Application. 1. Applications from candidates will be received, through Online mode in the Online Software Application provided for the purpose, within 10 days from the date of issuing of Notification. 2. Publication of list of candidates applied in each Gram Panchayat Office and Project Office by CDPOs on the next day after the last date of applications. 3. Verification of Original Certificates and other prescribed documents should be done by CDPO concerned on the designated dates within 7 days after the last date for receiving applications. 4. Final selection and display of the list of selected candidates in Collectorates, DWO Offices, CDPO offices etc. on the same day of the meeting of the District Selection Committee. 5. Issue of appointment orders within 3 days after the final selection by District Selection Committee. Before applying please read the instructions and information bulletin. Update on 21-02-2019: హైదరాబాద్‌ జిల్లాలోని మహిళా, శిశు, దివ్యాంగుల, వయోవృద్ధుల శాఖ పరిధిలోని ఐదు ఐసీడీఎస్‌ ప్రాజెక్టుల పరిధిలో ఖాళీగా ఉన్న మెయిన్‌ అంగన్‌వాడీ టీచర్లు, మినీ అంగన్‌వాడీ టీచర్లు, అంగన్‌వాడీ సహాయకురాళ్ల పోస్టుల భర్తీకి అర్హులైన మహిళా అభ్యర్థినులు దరఖాస్తు చేసుకోవాలని అధికారులు తెలిపారు. ఖా ళీలు, విద్యార్హత, రిజర్వేషన్లకు సంబంధించిన పూర్తి వివరాలు 22 నుంచి http://wdcw.tg.nic.in వెబ్‌సైట్‌లో అందుబాటులో ఉంటాయి. c. ఖైరతాబాద్‌ పరిధిలో 13 అంగన్‌వాడీ టీచర్‌, 29 సహయకుల పో స్టులు ఖాళీగా ఉన్నాయి. e. సికింద్రాబాద్‌ పరిధిలో 6 అంగన్‌వాడీ టీచర్‌, ఒక మినీ అంగన్‌వాడీ టీచర్‌, 21 సహాయకుల పోస్టులు ఖాళీగా ఉన్నాయి.